e were left with a broken body” , was one of the phrases that struck me the most when listening to my mother (Claudia) telling me about this strange disease that even doctors can not explain. “At times it becomes unbearable: generalized pains, intolerance to the cold, intense heat, the rubbing of clothes …”, he describes, and my eyes fill with tears because as there is no concrete explanation, either There is a cure. “You want the magic pill to appear to stop suffering, but it does not appear and you get frustrated, you get worse and the anguish instead of disappearing, increases”, Claudia. Why? Because apparently it is purely and exclusively emotional. “The cause of this pathology is still unknown, it is believed that fibromyalgia develops as a result of extreme sensitization of the nervous system or by genetic origin , which arises after physical or emotional trauma, by modifications in the brain areas responsible for pain or an infection “, explains Dr. Ernesto Crescenti (MN: 50.776) , doctor, researcher and director of the Immunooncology Institute. 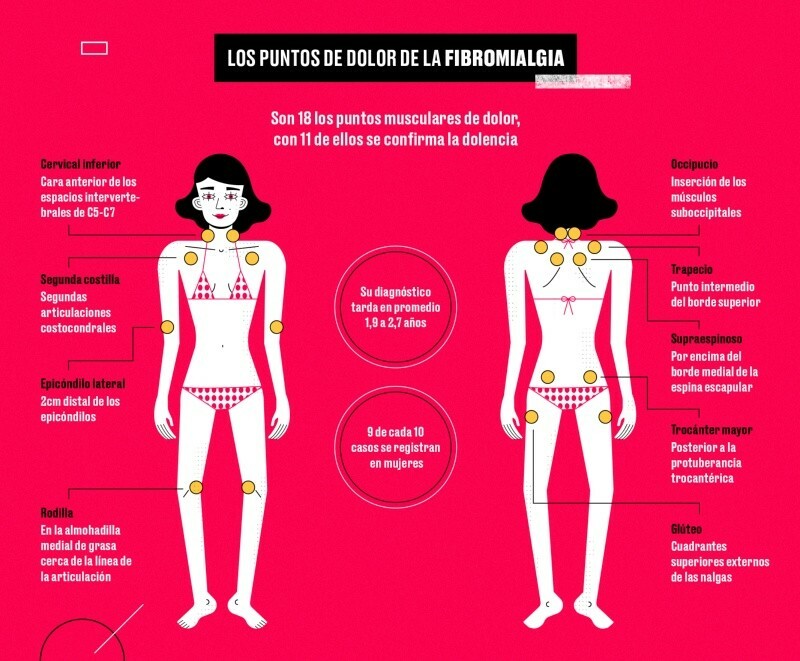 “The American College of Rheumatology defined the fibromyalgia syndrome based on a generalized pain history of at least 3 months, combined with sensitivity in 11 or more of the 18 sensory points,” says Dr. Gonzalo Yamauchi. , specialist in Family Medicine and Musculoskeletal Medicine. “Pain can have multiple forms of presentation, it can be diffuse and persistent, burning, stabbing or penetrating,” Yamauchi describes. “It is a disease recognized by all international medical organizations and by WHO since 1992,” Doctor Gonzalo Yamauchi. “The most frequent regions are the lumbar, cervical, shoulders, knees, thighs and arms.The pain usually gets worse with cold, infections, stress and lack of sleep.” Another symptom that is typically associated with pain is exhaustion. or chronic fatigue, without cause that justifies it, “Yamauchi lists. Who also adds that there are sleep disorders, problems falling asleep or frequent interruptions of sleep during the night. As well as feeling rigidity in the body (usually morning), headaches, abdominal discomfort, paresthesias, numbness and dizziness. “The evolution of the disease is chronic and will last over time, but the prognosis can be improved with an early diagnosis, correct information, and an appropriate therapeutic approach”, Doctor Gonzalo Yamauchi. “This disease, which mostly affects women between 20 and 50 years, results in a sensation of pain and hypersensitivity that affects the entire body,” Crescenti also points out. “It is fundamental to psychoeducate both the patient and the family to understand and be able to accompany them, knowing that there is a hereditary genetic burden of the picture,”recommends Dr. Evangelina Melgar, a psychiatrist and coordinator of the INECO Fibromyalgia Clinic. Exercises aerobic, muscle – strengthening exercises and stretching or flexibility, relaxation techniques to relieve muscle tension and anxiety, and educational programs that help you understand and manage fibromyalgia. It is suggested to improve the quality of sleep and mood that can be with psychotherapy or pharmacological treatments. There are several drugs that are used for fibromyalgia that help improve hypersensitivity, but there is no clear indication of a single drug. The choice is left to the treating doctor. Accepting the disease: It is one of the most complicated parts, but the sooner that process is completed the patient will be able to live with greater tranquility. This will involve taking on the pain, which can be mitigated, but which will always be present. Be able to transmit what you feel: It is necessary that the patient can transmit to their loved ones what happens to them. Accompanying you to the doctor can be very helpful, not only so that another person can hear the instructions, but because the more you know about the disease environment, the more you will understand and help. Be alert to mood changes: Fibromyalgia affects mood. It is frequent that there are changes of behavior, excessive reactions, bad humor, pessimism, apathy. The patient must do a work of self-knowledge, since the more aware he is of how he feels and the responsibility he has of his mind, the easier it will be to control him. Knowing the body: Knowing how to interpret the signals of the body is fundamental to be able to coexist better with the disease. Perform exercise: It is recommended to do physical activity, at least moderately. This will help the muscles and joints to be stronger and able to withstand the discomfort. Take care: Having fibromyalgia is no excuse to do what seems convenient and hurt yourself. The more we help the body to live healthier, the better. Meeting with others: Going to associations or groups, can be a good space to share what happens, seek consolation, give support to other people and thus, weave a network of understanding and mutual help. Rare diseases, such as fibromyalgia, are those that affect a small percentage of the populationand that have various symptoms and disorders that will attack depending on the case and the specific characteristics of each patient. There are between 5,000 and 7,000 rare diseases , which can affect physical ability, mental abilities or sensory and behavioral qualities. Most of them are chronic and degenerative diseases, of which 65% are serious and invalidating. In the course of clinical care it has been observed that the majority of patients who suffer from them usually have some problem at an emotional level or are going through a situation of anguish or stress . These emotions sustained over time seriously affect the development of daily life and health. The detection of these diseases can be insidious and delayed over time. In some cases the diagnosis can be delayed for years, since the doctor can usually interpret the symptoms as another disease and seek to improve them with common treatments. On the other hand, it is common for the patient to experience more acute periods and other periods of remission, which is when there is no symptomatic manifestation. It is only when the patient continues with the symptomatology that the diagnosis is fine-tuned, which can cause a great number of consequences, such as worsening of the disease or even putting your life at risk.